Water is essential to life. It need not be spelt out exactly how important it is. 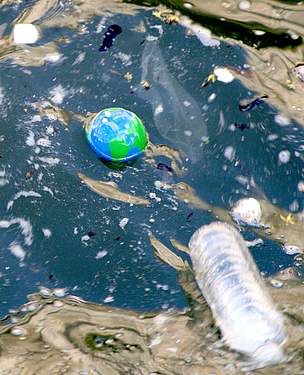 Yet water pollution is one of the most serious ecological threats we face today. Not only does this spell disaster for aquatic ecosystems, the pollutants also seep through and reach the groundwater, which might end up in our households as contaminated water we use in our daily activities, including drinking. Pollutants can be of varying kinds: organic, inorganic, radioactive and so on. In fact, the list of possible water contaminants is just too vast to be listed here. Polluted waterway. Hudson Park, New York City, USA.